ScrnShots.com is yet another social networking site for the InterWeb. This one targets a small niche market, sharing screen shots. It may seem a bit too narrow of a focus, but I'm going to give it a try for a bit. Specifically, I'm going to start posting new screenshots used in tutorials and posts on this site. I'll also add it to my my list of design inspiration sites to review when I begin a new project. ScrnShots includes all of the standard features, including tagging, favorites, feeds, and widgets. It also provides handy upload tools for both Mac and Windows. The Mac desktop uploader is available through a menu bar item and provides full screen, window, and area options. After capture you can easily caption and tag the screen shot then upload. Wordle.net is simple diversion for any typography or tag cloud fanatic. Enter a list of words and phrases or use a set of del.icio.us tags or the contents of an RSS feed to generate a stylized word cloud. Change the structure, colors, and font face to make the cloud your own. Here's my del.icou.us tag cloud. Finally, if you like to doodle, Scribbls.com is for you. The idea is draw two things that create something totally different when they're combined. Words can't explain, so give it a try. Be sure to check the most hearted scribbls. 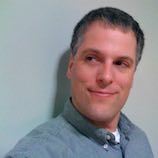 Hi, I'm Chad Kieffer, a web developer, designer, and database administrator living in sunny Tucson, Arizona.